Artist's illustration of Moon Express' MX-1 lunar lander on its way to the moon. 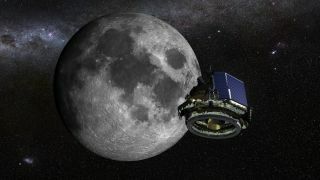 "The holy grail of our company is to provide, to prove, a full-services capability — not just landing, but coming back from the moon," said Moon Express co-founder and CEO Bob Richards, who announced the new launch deal today (Oct. 1) at the Space Technology & Investment Summit in San Francisco. If the MX-1 nails its landing on the first mission, "we're going to be inspired to try a sample-return," Richards told Space.com. "I don't know if we'll do that on the second mission, but I sure hope we're trying it by the third mission, if all is going that well." The two optional launches provide some insurance for Moon Express in case the first three flights don't go entirely according to plan, Richards said. "Rocket Lab is pleased to begin working with Moon Express to launch its spacecraft and to provide support to such an ambitious mission," Rocket Lab CEO Peter Beck said in a statement. "Moon Express has used advanced orbital mechanics to enable this mission from low-Earth orbit." "We think the collapse of the price to get to the moon is going to enable a whole new market — kind of like the 4-minute-mile of space," Richards said. The MX-1 landers that blast off atop an Electron will be relatively small, constrained by the rocket's size.. But the MX-1 is scalable, Richards said, and can be modified as needed to help the company achieve its ambitious goal of opening up the moon and its resources to commercial use. "As the market responds, we will be able to provide the platforms to support the market," Richards said. "We're starting small; we're starting with the baby steps." This story was updated at 3:45 p.m. EDT to add information about Astrobotic's plans.